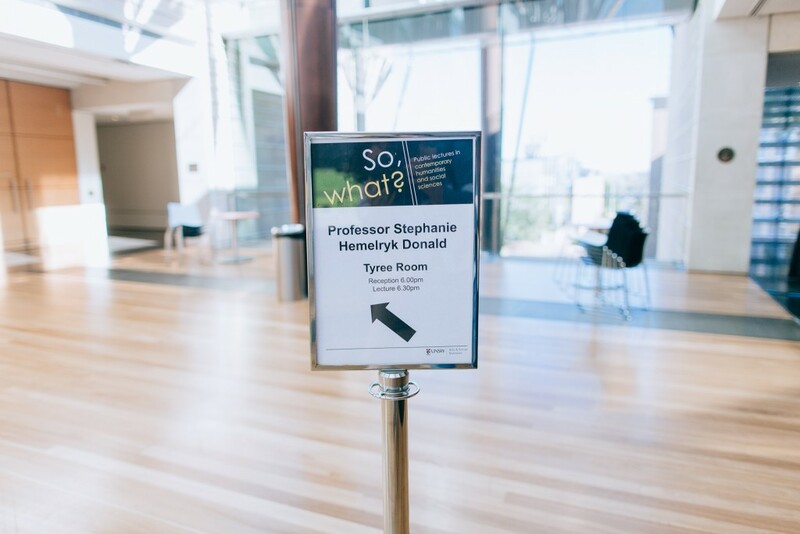 Stephi Hemelryk Donald began her ‘So What?’ lecture with words from Dorothy in Frank Baum’s novel The Wizard of Oz: ‘If we walk far enough, we shall sometime come to some place, I am sure’. She followed with the words: ‘Stories matter’! The public lecture was one in the series inaugurated by UNSW intended ‘to challenge and inform public debate and understanding by pushing the boundaries of public discourse’. The lecture came at the close of a three-day symposium on ‘Childhood and Nation’ organized by Stephi and Stefan Solomon as the inaugural event of the Leverhulme Research Network ‘Childhood and Nation in World Cinema: Borders and Encounters since 1980’. In the lecture Stephi was dazzling, speaking with verve about her topic and connecting it up to events current in the mind from the world stage. 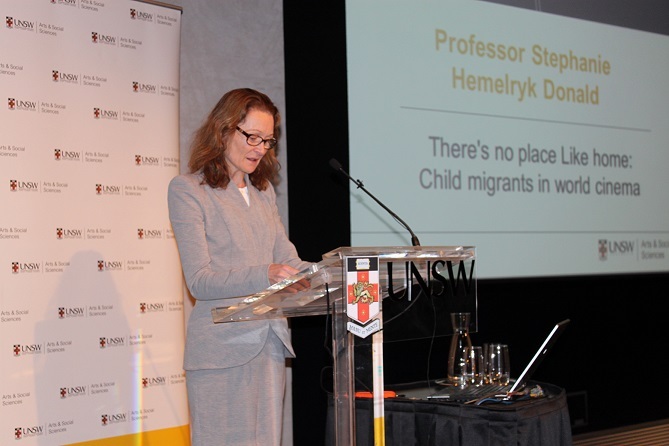 For Stephi, ‘the child migrant is an embodiment of human courage and adaptivity, the true cosmopolitan’. She continued: ‘the child cosmopolitan of much migration history is a grassroots, grounded person, a cosmopolitan by necessity, emerging from unintended or unescapable circumstance’. I have heard Stephi speak before about child agency and the politics of the representation in film where she has tied questions about the embodied and emotional presence of children on film, the attempt to meet and respond to a child’s subjectivity and experience, to issues about the real situations children face as they negotiate hostile political environments. Film can come close to the lived experience, the point of view, the conflicted emotions of the child and draw us to feel and understand her complexity, her relation to a compulsory situation. Stephi’s view of the child is remarkably robust and unsentimental, bound up with a sensing of children’s inner resources, their moves towards change and survival. Yet Stephi’s ethos too is one which palpably recognizes responsibilities towards children and offers response to their suffering. One such response is through the telling of their stories, the bid to let them be seen, felt and heard. Using The Wizard of Oz as her inaugural narrative Stephi explored the ways in which the book and film so brilliantly plot together migration and growing up, letting us see the (enforced) move away from home and move into adulthood as two parallel, mutually informing stories. She brought to light the emotional lining of The Wizard of Oz, its address to the confusion and contest of coming of age. Yet she also explored connections to a broader global and political history, considering the ways in which Dorothy’s journey can be interpreted, for example, as an ‘early expression of US colonial adventure’. She made a brilliant connection here to Claire Denis’s White Material, a devastating critique of the ravages of colonialism in an unnamed African country, where Isabelle Huppert stands like a girl-woman, Dorothy, in a wrecked land of exploration. Stephi’s work on child migrants itself migrates from context to context allowing a perspective on enmeshed and separate global histories. From Dorothy she moved to a second girl migrant, Ruth Balizka, heroine of Ian Serraillier’s The Silver Sword, a novel about the Second World War and childhood and which looks at child escapees from Warsaw. For Stephi, Ruth ‘personifies grace under duress, but also experiences the accelerated maturation of growing up in wartime with sudden, extreme responsibility for the survival of others’. She illustrated this point about accelerated maturation with poignant images from a UNESCO publication ‘Children of Europe’ and with photographs from an exhibition of war photography at the MCA Houston. For Stephi, Serraillier’s thoughts on the impact of war on children were echoed in the reports on children in war researched and published by UNESCO from 1995 to 2010, linking the past history to contemporary global conflicts. This is the brilliance and charge of Stephi’s work. She acknowledges that the child migrant is ‘a powerful fantasy structure of escape and infantile freedom’ used by adult storytellers and documentarists, yet she forges connections always to the real situations of living children, allowing stories and life-histories to illuminate one another, showing the real referents to which her stories point. This connectivity informed her responses to other wartime dramas such as René Clément’s Forbidden Games, Louis Malle’s Au revoir les enfants, and on to different contexts, to histories of the Indigenous girls in Philip Noyce’s Rabbit Proof Fence, and to contemporary narratives of immigration like Michael Winterbottom’s In this World and André Techiné’s Loin. And close to the end of the lecture she addressed a very recent film, Sydney-based filmmaker Sophia Turkiewicz’s autobiographical documentary Once My Mother from 2014 about the deportation of Polish adults and children to Siberia in the early 1940s. As Stephi stated very movingly: ‘The film’s patient unwrapping of the causes and sources and repetitions of trauma succeeds in commanding that collective gaze onto the long-term impact of a child’s forced mobility, and her lifelong search for home’. As Stephi said towards the end of the lecture: ‘Home is not in this world or in another. It is in both and none. There’s no place like home’. Running through the discussion was a series of reflections on Stephi’s own work in filmmaking workshops with migrant children, Afghan children in London, young migrants in Guangzhou, China, refugee children in Sydney, and she showed some of their work to the public in the context of the lecture. The day after the lecture participants in the symposium had the chance to meet some of these child filmmakers on a trip to the ICinema at UNSW. We sat on the floor and watched film of virtual Sydney spiraling around us, we found ourselves in a mass television space with infinite juxtaposed screens, and deep in a coalmine watching for the escape of gas and collapse of the tunnels. Then we watched the children’s own films with Stephi. The girls I was sitting with came on a boat to Australia from Sri Lanka two years ago. They sat ecstatic, raptured, watching their own films screened, laughing hilariously at themselves onscreen. I saw the effect of the work they’d done with Stephi. At the end of her lecture Stephi cited one of the UK Afghani workshop participants who worked with her: ‘We learned that a journey isn’t just moving from place to place. It can also be making friends or starting something new’. This is the vision Stephi left us with, showing how cinema makes visible the tales of migrant children, and how these children themselves are beginning to tell their own stories on film.